Why Is Ubuntu the Most Popular Platform for Cloud? 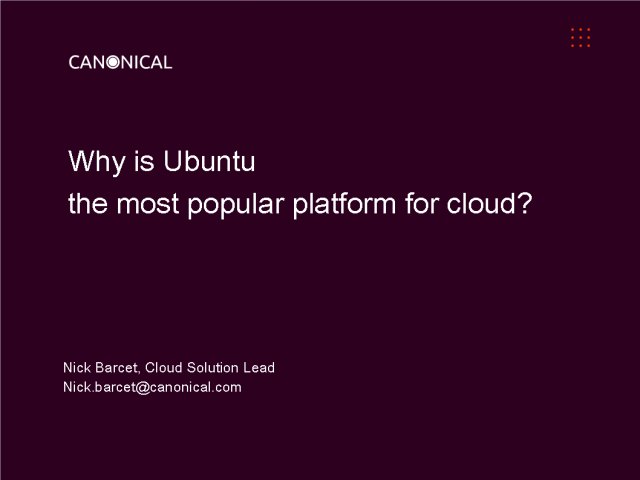 Join Nick Barcet, Cloud Solutions Lead, for a lively discussion on Canonical's Ubuntu OS, a key enabling technology for Enterprise Clouds. Learn how Ubuntu Enterprise Cloud implementations address Amazon EC2 compatibility, public/private cloud interoperability, and more. Ask a question of our experts and gain insights that will guide your own cloud deployment. Title: Why Is Ubuntu the Most Popular Platform for Cloud?